Whip and dipole antenna system. Measure omnidirectional flux of protons and electrons above certain threshold energies in order to determine the temporal variations in the radiation environment. Verify information pertinent to radiation effects on various transistors. Determine the effectiveness of seven selected thermal coatings. Determine the effectiveness of protective coatings on solar cells in preventing degradation due to radiation. Backup Satellite Transit-5BN-1 Objective to increase knowledge of the earth's shape and gravitational field. Measurement of artificial radiation belt decay. Time variations, lifetimes, and response times to magnetic activity of outer zone electrons. Day-night distortion of outer radiation belts. Loss of particles in the South Atlantic anomaly and their subsequent replenishment at longitudes removed from the anomaly. The determination of a nightside magnetospheric configuration based on the observations of trapped electrons in the outer zone. The finding of a 27-day cycle (the solar rotation period) in the trapped electron intensities in the outer zone. Initial results giving behavior of outer zone electrons during magnetically active periods. Tentative understanding of behavior of energetic electrons in outer zone during magnetically quiet periods. Study of the effects of a solar high-energy proton event as seen throughout the magnetosphere. The solar science experiments have contributed materially to numerous studies concerned with the solar spectrum and long and short term variations in solar intensity. Solar data have facilitated development and calibration of solar simulators and have aided in the development of improved solar cell protection devices. The transistor reliability study included accurate measurements on the effect of radiation on the performance of selected transistors in orbit, and also provided degradation data that were in excellent agreement with theoretical predictions of the electron density which would produce the observed degradation. The measurements also complemented data received from the electron spectrometer experiment. Satellite 5E-1 fluxgate magnetometer data were used in the detection of one component of transverse hydromagnetic waves. The studies thus far have shown that: (1) the waves appear primarily in the auroral regions; (2) the magnitudes vary between 25 gamma (the lower limit of fluxgate sensitivity) to about 400 gamma, representing about one percent of the main field at the satellite altitude (1 gamma = 10- 5 gauss); and (3) more than 100 disturbances have been found. Satellite 5E-1 provided excellent geodetic data; the satellite longevity resulted in the fulfillment of Objective No. 5. The 162 MHz transmitter failed on 19 March 1964 and the resultant load change has since allowed only limited operation in battery mode. However, the major satellite experiments were not seriously affected. Satellite 5E-1 has become one of the most productive satellites ever launched. 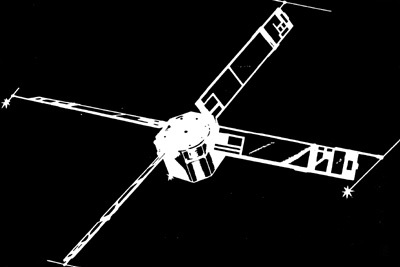 Data were acquired routinely for over six years and the satellite has functioned for a full solar cycle (11 years).